Freesia have appeared at the farmer's market! Spring is coming! 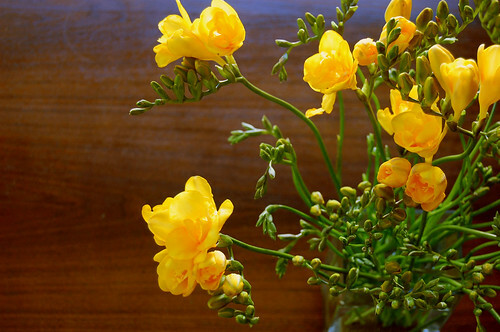 Freesia are one of my favorite spring flowers - they're so simple and not showy at all and the fragrance is amazing. I hope they stick around until Easter. I love freesia too. The most fragrant is red I find, with purple and yellow being a close second. White has a peppery scent. So pretty! Almost all of our snow is melted! I'm seeing the daffodils peak through the ground! Spring is certainly on it's way! Freesia is one of my favorites, too. Especially when it comes from the Farmer's Market. These yellow ones are gorgeous! Those look so happy! I bet it perks up your mood just having them in the room! Freesia is a favorite of mine, too. That scent! I have a little patch in the garden that produces about a month's worth of bud vase bouquets...and I just saw a couple of buds this week. An exciting sign of spring! The smell is so divine. I picked up two bunches for a baby shower I threw a few month ago and it was hard to keep setting up for the party; I just wanted to keep smelling them. i'm right there with you. my parents have freesia growing all along the side of the house in brilliant yellows and purples and they smell so wonderful. Just beautiful! Can't wait for spring blooms to pop up in my yard! I love freesias too! Such a gorgeous fragrance! yellow and blue are great together - love that stool! And they smell so incredible! They are planted all over my neighborhood and whenever I walk the dog I just take the scents all in! i'm with you...they smell fantastic! Do they last a long time? I'm looking for a wedding bouquet accent flower. My mom keeps our front yard stocked with freesias so I've always had an affinity for them. And looks like you have a cute little deck, yeah? oh how i LOVE spring!! it just smells sooo good! freesias seem to embrace simplicity with a touch of dainty in my opinion! what a happy burst of color. i always love the looks of your flowers and furniture! enjoy the yummy scent! aw, thanks for the sweet comment about the show, rachel! we wished you and the huz could have been there too, but then circe's wild coat would have gone another week untamed. about those freesia...peter proposed to me on a park bench in central park with a sprig of yellow freesia. he wasn't sure which bench would be available when we walked through the park, so beforehand he had taped sprigs of yellow freesia under EVERY PARK BENCH down the mall, that long promenade of elms. so they have a *very* special place at the tip-top of my pantheon of favorite fleurs. so pretty! 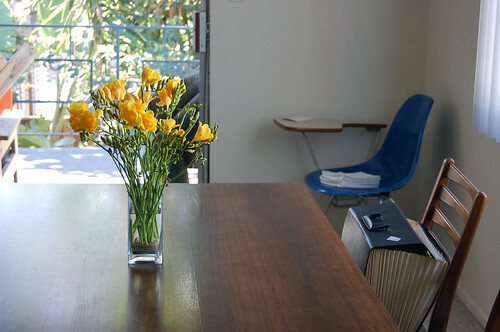 there's nothing like fresh flowers to brighten up a room. i can't wait til the farmer's market comes back out here.